The utility transmission, and distribution and communication industry had a strong 2018, but with more mixed results than anticipated this time last year. Investor-owned utilities remain in a multiyear investment cycle driven by the need to repair, replace and upgrade the transmission and distribution infrastructure across the United States. The aging investor-owned utility construction and repair workforce has increased the revenue of utility contractors, which are now the primary service providers. However, the construction of fiber networks to meet the growing demand for broadband service has lagged in some parts of the country, as engineering limited construction expectations. Additionally, the infrastructure investment expected from Congress did not materialize. We enter 2019 with both high expectations and new challenges to similar growth. Outsourced utility-related construction is anticipated to nationally be an opportunity of approximately $60 billion in 2019. It is anticipated to grow at a combined compound annual growth rate of 3.6 percent into 2021, reaching nearly $66.2 billion. Of the total opportunity, approximately 60 percent of the market is composed of maintenance and repair related work, which is expected to grow at a lower rate of 3.3 percent CAGR. New construction related opportunity, while smaller, is expected to have more greater growth, at 4.0 percent CAGR. One of the significant drivers of opportunity in the utility construction market is a shift towards greater outsourcing of services to third-party contractors. Utility providers are doing this to a greater extent because their internal staffing resources have declined in the last decade and have not been replaced. This has occurred primarily in electric utilities. As the underground construction industry has continued to grow, limitations and risk factors are present that could impact sector performance. The most significant is the demand for labor to complete the work opportunities that exist. Multiple initiatives are ongoing across the industry to recruit and develop the workforce, and individual companies have expanded their own internal training plans. However, training and development of people takes time and could impact industry growth. Rising interest rates at the Federal Reserve will affect the volume of construction. Investor-owned utilities and LDC’s have been able to borrow money at very low rates to implement their investment plans. As borrowing costs rise, however, we anticipate the burden on the rate payer will increase. Aggressive power distribution contractors fared well in 2018 with the rise of distribution spending. They should have similar results in 2019. Overhead to underground initiatives have been a great opportunity for contractors in the Southeast and the recent fires in California, related to down power lines, may create change in California and other parts of the country. The assets and technology that represent the backbone of our electric infrastructure were put in place in the 1950s and are near the end of their life cycle. An estimated 45 percent of electric distribution assets either currently or will soon need replacement due to reliability concerns. Along with required power line infrastructure, significant investment will be made in complementary infrastructure. For example, utility scale power storage is expected to grow rapidly as distributed generation becomes more common. In addition, aggregated distributed generation groups are working with utility commissions to sell excess power back into the broader network. Electric vehicle charging infrastructure also has the potential to receive rate base approval in select states. The outlook for the natural gas transmission and distribution contractors is very strong. Demand for natural gas has increased in electric power generation, industrial use, exports and residential heating. New power generation will primarily come from natural gas or renewable sources such as wind or solar. The price of natural gas will largely determine the generation direction over the next 20 years. Natural gas-fired power plants are the primary source of new utility-scale generating capacity today. To accommodate this growth, companies have had to repurpose or reverse existing pipelines and laterals to gas-fired generators, build new pipelines and increase storage infrastructure. Compared to 2017, over 10 percent more capacity has been put in place in 2018, and there are strong expectations for 2019 at current price levels. We expect similar transmission pipeline mileage in 2019 with the current backlog of expected projects. For the distribution contractor, North American gas local distribution companies continue efforts to remove cast-iron and bare steel in 20- to 30-year replacement programs addressing aging infrastructure. PHMSA oversees almost 2.2 million natural gas main and service miles. of which almost 30 percent are “leak-prone.” Unlike other utility products, the combustible nature of gas does not allow for poor maintenance and inspection practices. This was felt profoundly in Lawrence, Mass., when over 40 homes experienced explosions and over 80 homes were damaged in fires as a result. Approximately 60 percent of the U.S. gas distribution network was built prior to 1970. The most leak-prone distribution pipeline material is cast iron, which still represents approximately 3 percent of gas mains in the U.S. Bare steel is the second most leak-prone material and represents 4-to-5 percent of gas mains in the U.S. Using estimates from the American Gas Association and PHMSA data, the cost to replace leak-prone pipe in the United States is still greater than $300 billion. The communication construction segment (up 5 percent year-over-year) is experiencing similar tailwinds. The emergence of 5G wireless technologies marks the next great shift in telecom infrastructure (i.e., from wireline to fiber). Without the far-reaching densification of deep fiber, carriers will be unable to support the projected increase in mobile traffic growth by 2021. Multi-year initiatives led by telecom service providers will create fiber installation, small cell deployment, and ongoing maintenance contract opportunities for those operators with the requisite fiber construction capabilities. In addition to the new projects, maintenance of existing communication infrastructure has its own challenges. Early long-haul fiber projects are nearing useful life of the infrastructure and will require maintenance or replacement. The primary limiters to substantial growth are the speed to market of 5G and the engineering requirements associated with an increasingly complex network. Major service providers are also struggling to increase capacity to meet customer expectations without increasing cost at a similar rate. The water and wastewater segments will play a critical role in stabilizing utility-related construction through the forecast period. FMI Research projects that both segments’ construction put-in-place, taken together, will grow at an annualized rate of about 4 percent from 2018 to 2022. While water and wastewater construction spend is not expected to rise to the level of industry highs recorded in 2008, it is expected to come close by the end of the forecast period. Demand in both segments will be driven by the replacement of aging infrastructure, population growth, residential and utility construction, and state and local government spending. In addition, the opportunity for ongoing, lower-margin (but less cyclical) maintenance work will grow as additional capacity is installed. This segment accounted for roughly $14 billion in revenues during 2017 (not accounted for in the FMI forecast). Reliability risks associated with aging water and sewer pipeline infrastructure are exacerbated by neglect. State and local governments facing severe budget deficits (as a result of decreasing property tax revenues), were forced to choose between competing objectives of affordability or quality. In order to stay afloat, municipal water utilities chose to allocate their limited funds toward maintaining the status quo – delaying the inevitable capital-intensive replacement of at-risk infrastructure. The American Water Works Association cites the renewal and replacement of water infrastructure as the most important issue faced by the water industry. Its findings suggest the vast majority of underground water pipelines in the U.S. are either nearing or have already surpassed their useful life and that over $1 trillion in investment will be needed through 2035 to adequately address the current state of the country’s water-related infrastructure. In the U.S., small, municipal water utilities are largely responsible for all costs tied to the maintenance of our water and sewer infrastructure (less than 1 percent of funding comes from federal sources). This remains problematic given that less than one third of water utilities can cover maintenance costs despite accelerating usage rates from population growth. Federal funding to the water and wastewater industry has varied historically and, ultimately, failed to keep pace with the level of assistance needed. The newly passed Water Infrastructure Act of 2018 provides some much-needed federal support in the near-term. This new law authorizes $3.7 billion for new Army Corps of Engineers projects and $4.4 billion for drinking-water projects. It also reauthorizes the Water Infrastructure Finance and Innovation Act (WIFIA) at $50 million and the Drinking Water State Revolving Fund at $4.4 billion. These funds can be utilized for loans, loan guarantees, bond insurance and project refinancing. While this is certainly a positive development, a significant influx of capital is needed for local water utilities to ensure safe water for their customers. 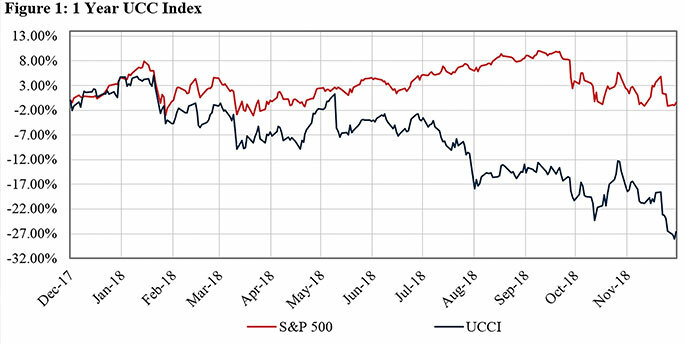 The Utility & Communications Construction Index (UCCI) presented below presents the stock performance of the sector’s publicly traded stocks over the past year (Figure 1) and the past five years (Figure 2). 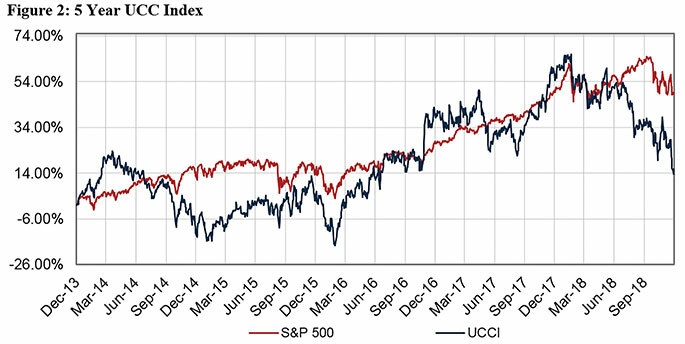 The One-Year UCCI performance is poor relative to the performance of the S&P 500. Part of this is due to the expectations for an infrastructure package at this time last year. Another component is the lag in the communication construction expectations related to broadband infrastructure. The results are depressed stock prices. However, companies in the UCCI have been very bullish on themselves. Multiple members of the index have initiated stock buyback programs over this time period and have aggressively acquired stock they believe to be undervalued. Quanta Services, Mastec, Dycom, MYR Group, Aegion and Matrix Services have all implemented a buyback program. As we look at performance across the UCC Index (figure 3), the companies seeing the most improvement have connections to materials and the communication segment. The segment has fared very well over the past two years with average revenue growth of approximately 9.2 percent. 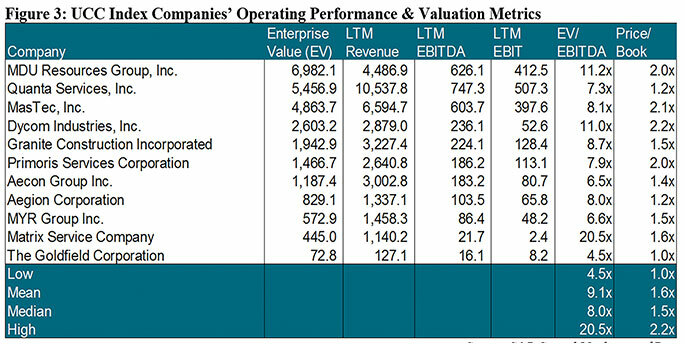 Interestingly, the companies have maintained an average EBITDA margin over 10 percent during that time frame, even with the revenue growth. 2018 could be termed the year of acquisition based upon the volume of activity and the number of new entrants into the underground market (figure 4). The fourth quarter of 2018 was no different in this regard. The acquisition of Linetec Services by Centuri Construction is a notable entry into the power segment and a diversification away from the gas distribution core of Centuri’s business. MWH Constructors is also a major transaction due to the impact it could have on utility contractors. MWH was internationally ranked as the No. 1 contractor in wastewater treatment and the No. 3 contractor in sewer and waste by Engineering News-Record. Current large-scale project work is being constructed by MWH around the country. On the other end of the spectrum Dixie Electric filed for bankruptcy in November of 2018 under Chapter 11. In 2019, M&A will likely continue at a robust pace due to the growth plans of some of the new entrants into the construction market. Private-equity-backed companies, such as Peak Utility Services, Powerteam Services, W.A. Chester or Hylan, have growth plans that include acquisition. Continued consolidation will increase competitiveness in populated markets and increase the capital availability of the contractors, as well. About the Author: Dan Shumate is a managing director with FMI Capital Advisors. He focuses on mergers and acquisitions and business continuity transactions in the utility transmission and distribution sector.